Home » Health » What Is Alopecia Areata? Alopecia areata is hair loss caused by an attack of the body's own immune system ( auto immune ) against the follicle. This condition generally occurs on the scalp, although it can also occur in other hair-covered parts, such as eyebrows, mustaches, and eyelashes. In addition to round patterned baldness, alopecia areata can also cause complete baldness. Alopecia areata can be suffered by anyone, whether male or female, in any age. But generally this condition is more experienced by people aged 20 years and under. 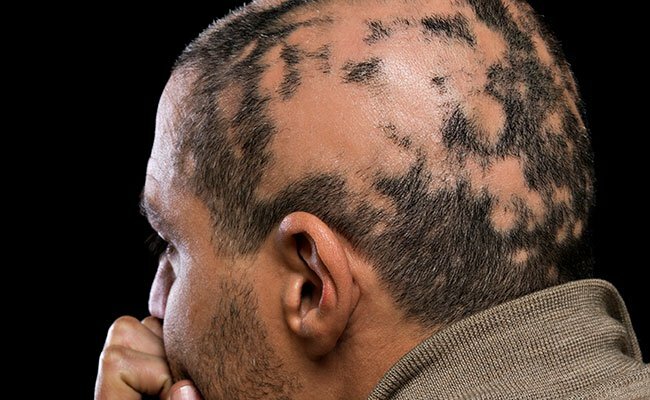 Alopecia areata is an autoimmune disease in which the body's immune system in charge of protecting the body from virus or bacteria attacks actually make the mistake of attacking the body itself. In this case, the attack is a hair follicle. As a result, the hair follicle which is where the hair grows becomes smaller and stop producing hair so there is baldness. The main symptom shown by alopecia areata is round patterned baldness. Baldness can occur in one or several places that had been overgrown with hair. Sometimes, new hair appears on the edge of a bald area. But the hair shaft is thinner at the base, so it looks like an exclamation point. In some patients with alopecia areata, baldness may extend to the scalp (alopecia totalis). Although rare, baldness can also occur throughout the body so as not to leave a single strand of hair (alopecia universalis). Sometimes, hair can grow back after a few months, but with a thinner texture and white, different from previous hair. Nevertheless, in about 10 percent of people with alopecia areata, baldness is permanent and hair will not grow back. In addition to the scalp and other body parts covered with hair, alopecia areata can also be characterized by disturbances on the fingernails of the fingers and toes, in the form of grooved nails and has a white line with a thin and rough surface. Sometimes the nails may change shape or split, though this is very rare. The cause of autoimmune disorders in alopecia areata cases is unknown, but is suspected to be triggered by viral infections, trauma, hormonal changes, and physical or psychic distress. Alopecia areata sufferers are also found in people who suffer from other autoimmune diseases, such as type 1 diabetes or rheumatoid arthritis . Alopecia areata can be diagnosed by a doctor through examination of the condition of hair, especially hair loss that occurs. In order to strengthen the diagnosis, investigation can be performed through analysis of scalp samples using a microscope. This examination aims to ascertain the cause of hair loss. If there is a strong suspicion that the patient has an autoimmune disease, then the doctor may recommend a blood test to check for abnormal antibodies, such as antinuclear antibody (ANA). Other blood tests may also help doctors to determine other causes of baldness, such as levels of C-reactive protein , iron, thyroid hormones, testosterone, follicle stimulating hormone (FSH), and luteinizing hormone (LH). Minoxidil . This topical medication can stimulate the growth of hair back by applying it on the scalp, beard or bald area twice a day. New hair growth can be seen three months after the use of this drug. Corticosteroids. Corticosteroids will suppress the immune system and are available in the form of injectable drugs, rubbing, and drinking. Corticosteroid injections are administered on bald skin every 3-6 weeks. New hair will grow about a month after the last injection. Administration of corticosteroid injections is considered more effective than the use of topical corticosteroids. Topical corticosteroid administration may be appropriate for children, who are usually afraid of needles. While the consumption of corticosteroid pills is intended for patients with extensive bald areas and many. However, long-term corticosteroid consumption is at risk of serious adverse events. Anthralin . Just like corticosteroids, this drug will affect the immune system of the skin. After applying and sterilized for a maximum of one hour, anthralin should be washed thoroughly to prevent skin irritation. Diphencyprone (DPCP) . This drug is used with applied to the area experiencing alopecia areata and will cause allergic reactions such as redness, swelling, and itching in areas that experience baldness. The emergence of allergic reactions is the expected effect of the drug's use, and is intended to divert the body's defense system against inflammation due to allergies, rather than attacking the hair follicles. Although not harmful, but sometimes alopecia areata can cause discomfort in the skin that experience baldness. Applying sunscreen cream and using wigs or hats can protect scalp from baldness from the sun. The use of fake eyeglasses and eyelashes is also recommended for patients with alopecia areata in the lashes, this is to protect the eyes from dust. Alopecia areata is not a disease that can lead to serious conditions. Alopecia areata also can not be transmitted to others and bald hair can grow back by itself in a few months. But in about 10% of patients, baldness is permanent. Patients with alopecia areata have a greater risk of suffering or having a family with asthma, allergies, and other autoimmune diseases, such as thyroid disease and vitiligo . Some alopecia areata sufferers may be emotionally disturbed, because they consider baldness to make themselves unattractive. This situation can lead to depression. Support from the nearest person is important to help the patient adapt to this condition. 0 Response to "What Is Alopecia Areata?"